The group will present a concert of ensemble music of the Renaissance and Early Baroque. 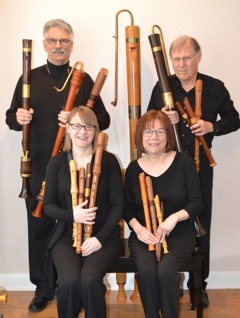 The quartet will perform with 27 different recorders, including two matched consorts of Renaissance recorders and two different consorts of Baroque instruments. The concert will feature two ensembles featuring instruments at 8' pitch with great bass and contrabass recorders. Gerald Self will narrate, providing background and context for each selection.